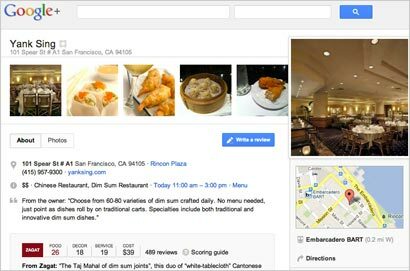 Google provided free recommendations and reviews from Zagat on Wednesday, serving up content on Google+ in a feature the tech company calls Local. After paying millions for the site and the content in September, the tech company will finally link social with maps and search features. The Local tab in Google+, available on both desktop and mobile, offers a list of nearby recommended places. The new service will also appear across Google's Search and Maps for desktop and mobile, combining content from one listing. Available today on devices running Android, the product will soon launch for Apple iOS. Reviewers can share opinions and upload photos on places to eat. User reviews determine the scores in Google+ Local based on a 0 to 3 point scale, from Excellent to Poor or Fair, using Zagat's 30-point scale. Google takes ratings, creates an average, and then multiplies them by 10 to arrive at averaged scores. Ratings given to Food, Decor, and Service accompany the average cost. When there are not enough user ratings, Google will show an overall score. A Google spokesperson said there was "no way for a company to buy their way to the top of the listing." Photos and videos appear to drive the vast majority of engagement between consumers and businesses on Google+, according to a SimplyMeasured study. Google+ continues to gain market share, and more brands have begun to adopt business pages, albeit slowly. The average weekly engagement rose 112% since February, and content engagement rose 65%, according to SimplyMeasured. Since its February update, two new brands on the Interbrand Top 100 list became active on Google+: Xerox and Nike. In that same time period, the circler counts of 22% of the brands rose 13% to more than 100,000. Local will not only offer restaurant recommendations, but also shopping, hotels, resorts, spas, golf courses and other categories in about 100 countries.